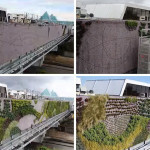 Vancouver-based Green Over Grey designed ‘Mountains & Trees, Waves & Pebbles’, a living wall project with 120 unique plant species and over 50,000 individual plants, for Guildford Town Centre in Surrey, British Columbia, Canada. You can watch a time lapse video of the installation – here. 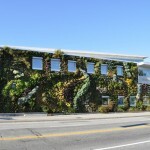 At over 10,000 square feet (10,150 square feet to be exact) , is is by far the largest living wall installation anywhere in North America and broke our previous records for the Semiahmoo Library (British Columbia, Canada, 3,000 square feet, completed in 2010) and King County Library in (Bellevue, WA , 3145 sqft). 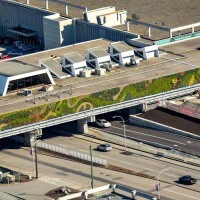 It is double sided (east and west exposure) and installed above a busy road on an overpass that connects two sections of the Guildford shopping centre. 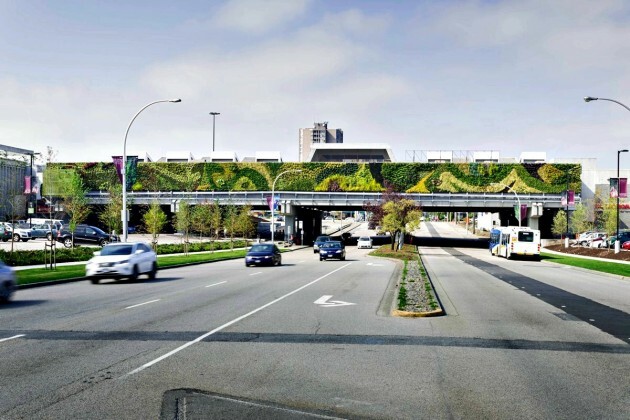 As such it is also the only green wall in North America built directly over a roadway. Maintenance is performed through a custom engineered rolling platform that allows for safe access without to ever having to close the road below. “I wanted to gather inspiration from the natural beauty that one would experience while crossing our province [British Columbia (BC) in Western Canada]. Starting with the mountains; I am a huge fan of still photography and mountains provide the organic and free-flowing patterns which we’ve found resonate best with people when viewing our planted work. Forests and trees are what fill the mountains and valleys of BC. Some trees are botanical works of art without a single flaw. While others, such as those growing on craggy outcrops, do the best with what they have been dealt. Some grow into bizarre looking bonsais providing inspiration and the power to expand our creativity. Free-forming tumbling and the natural curvature of waves are easy to incorporate into designs as they perfectly embrace rhythm and fluidity. For thousands of years waves have crashed on the coast of BC. With each impact they grind, break and then immaculately polish stones; from immense boulders to smooth pebbles. Many of these pebbles still contain the patterns of the mighty mountains from whence they came. Lawren Harris, of the famous Group of Seven, is one of my favourite Canadian artists. For this project I revisited some of his paintings as they provide a structured yet whimsical take on natural forms. Although from Ontario, Harris travelled out west and was inspired by the natural beauty that he saw. 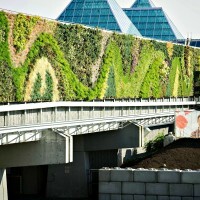 It includes mainly native plants to B.C, creating a new microhabitat and further biodiversity within the urban environment. The plants offer food to small birds, butterflies, bees and ladybugs in the area. 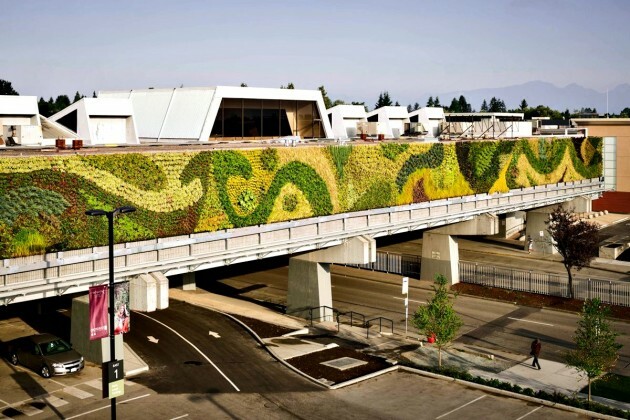 With the green wall covering close to 10,000 square feet of the exterior, it acts as a protective barrier, shielding the building from solar radiation and heat penetration. This feature improves energy efficiency by reducing the need for cooling systems and providing insulation during colder weather. 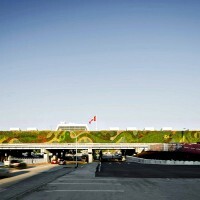 The wall also acts as a carbon sink – the carbon that is absorbed and stored from approx. 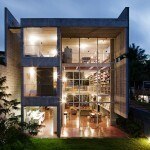 215 square feet of wall space is equivalent to a medium sized tree which is approximately 47 trees for this project. 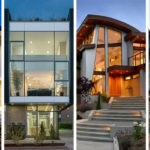 – The wall is fully hydroponic (i.e. dirt-free) and incorporates plants that thrive in similar vertical environments found in nature, like on tree branches and next to waterfalls. 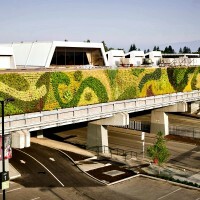 – The Green over Grey Living Wall system is made of 100% synthetic recycled materials. It incorporates waterproof eco panels that are made of recycled water bottles and plastic bags. 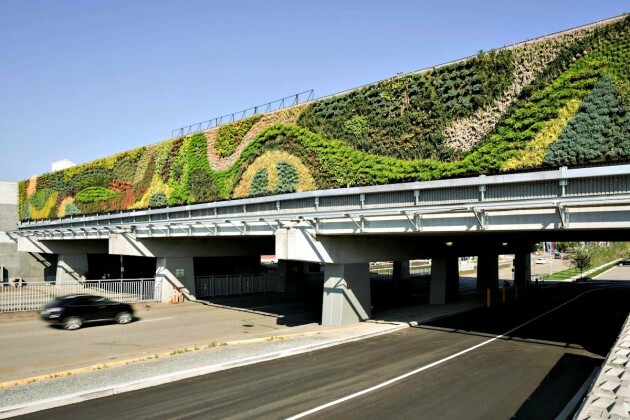 This project kept over 20 metric tons of plastic out of our landfills. – The watering is automatic and contains minute amounts of dissolved nutrients; it comes on for a few minutes per day. 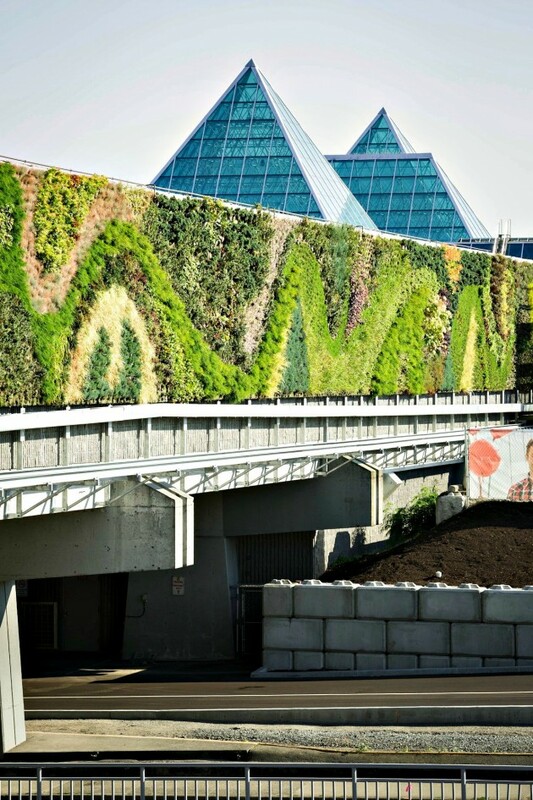 – There is a drip irrigation system within the living walls the percolates down through the layers of recycled fibres. – Maintenance involves trimming back the plants as they grow and removing flowers that have finished blooming. 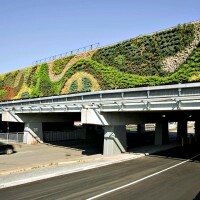 – There are 120 unique plant species which also makes this one of the most biologically diverse green wall on the continent. 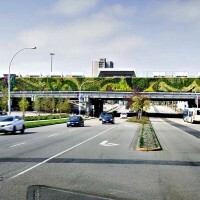 – There are more than 50,000 individual plants. 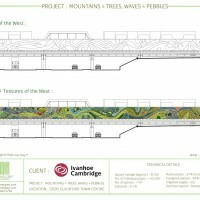 – The west face which is seen when driving eastbound towards the mountains is a representation of mountains and trees. 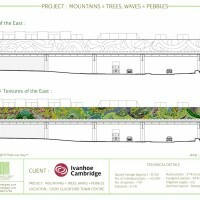 – The east face which is seen when driving westbound in the direction of the coast is a representation of waves and pebbles.